Caution: Do not take asprin or ibuprofen as self medication if you have fever that matches the symptoms of dengue. Asprin increases tendency to bleed. Dengue reduces platelet count and increases tendency to bleed. Asprin given to a dengue patient will increase chances of hemorrage and shock. Covered in small news stories is a large picture of the dengue fever season this year. Dengue fever is caused by the dengue virus that spreads through the blood feeding of the aedes female mosquito, particularly A. aegypti. The number of cases of dengue fever worldwide have gone up by 30 times in the last fifty years, and are increasing in India as well. 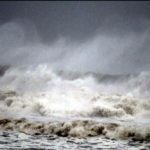 The cause is theorized to be increasing urbanization and ecological changes that allow the aedes aegypti mosquito and the dengue virus to thrive. While most patients of dengue fever will make unremarkable recoveries and will not even require hospitalization, some cases can escalate to bleeding, shock and death. 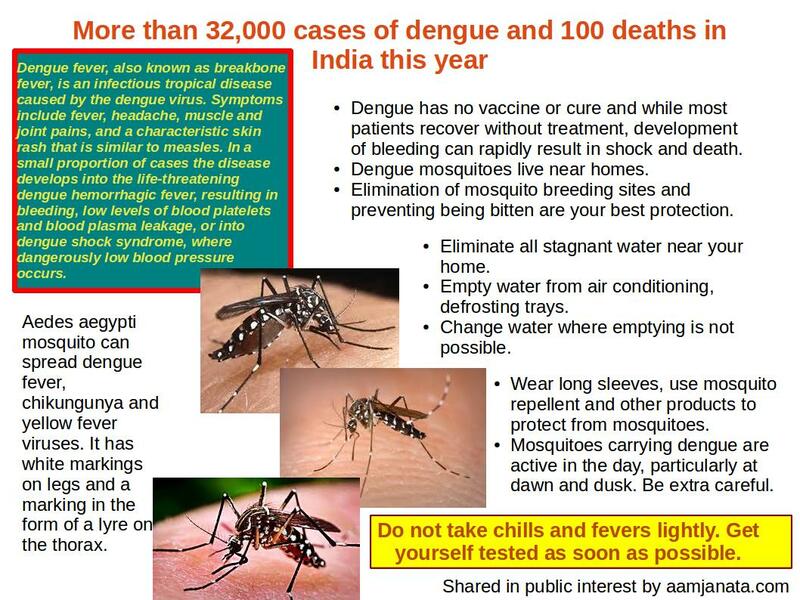 There is no vaccine or cure for dengue fever and treatment is symptomatic. The best bet for protecting yourself is to prevent aedes aegypti mosquitoes from breeding and biting. You should eliminate mosquito breeding grounds, kill or repel them from homes and living spaces and to use mosquito repellent and cover your body if spending any time in an area where mosquitoes are active. Watch out for mosquito bites during the day and particularly at dawn and dusk, when the aedes aegypti mosquitoes are most active. Do not think that upscale localities are safe. Surveys by Mumbai’s BMC found that over 60% of mosquito breeding spots detected were in upscale localities. This year’s victims of dengue fever include Gurgaon’s police commissioner Alok Mittal and Haryana chief minister Bhupender Singh Hooda’s son-in-law, Assistant municipal commissioner (Mumbai) Chandrashekhar Chore and Deputy Director of National Institute of Virology, Dr. M S Chadha. The wife of a senior IPS officer died of dengue fever. The point is that breeding mosquitoes do not look at the class of the locality or education of its blood sources. Better be safe than sorry. Symptoms for dengue fever, particularly in the earlier stages can be vague. However, please approach a doctor and ask to be tested in case of high fever, chill, pain behind the eyes, severe stomach pain or stomach upset. Tests like NS1 or MAC Eliza test (for viral antigen) can confirm the presence of the dengue virus. Worsening abdominal pain, ongoing vomiting, liver enlargement, mucosal bleeding, high hematocrit with low platelets, lethargy or restlessness and serosal effusions are all considered to be serious warning signs and will usually prompt doctors to recommend hospitalization. Any bleeding from the nose or blood in urine should be reported to a doctor on an emergency basis. More information will follow on this blog, but for now, here are the highlights.